Strong support given at police chief confirmation hearing - KUAM.com-KUAM News: On Air. Online. On Demand. "For many years I have seen chiefs come and go the GPD seems to splinter and fragment more each time my belief is the causation that many chief catering to certain cliques and factions in our department," Officer Christopher Shane Dawson testified. "I have known the acting chief my entire career during my tenure I have never seen him play into this pari pari atmosphere." "Capt. 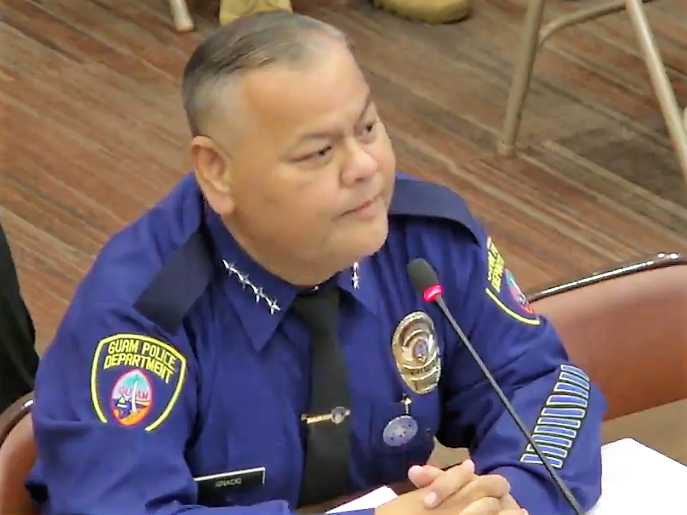 Ignacio has served in different capacities providing the multitude of services to the public that are expected of the Guam Police Department," Bob Lizama testified. "Capt. Ignacio was a police officer, a detective, a supervisor, a manager and now as chief of police appointed." During his confirmation hearing, the acting chief outlined some of his accomplishments since taking over as well as some of his goals to lead GPD forward, such as hiring more police officers, purchasing more patrol cars, updating telecommunications and upgrading technology for more efficient report writing. He announced plans for the construction of a new evidence control section in Yigo and discussed his plans to grow neighborhood watch programs and opening a new headquarters in Sinajana. Senators did not make mention his polygraph and psychological test results, also requirements to be confirmed as chief of police. Committee Chair on Public Safety Sen. Jose "Pedo" Terlaje, however, said at the end of the confirmation hearing that "you are going to be Chief of Police."